You don’t have to turn your church into a fortress. These strategies and tactics are almost invisible to the untrained eye. Your church will remain the friendly, welcoming place it’s always been. However, you can rest easy knowing that if the unthinkable happens, you have a proven system in place to stop the threat quickly and protect your flock. On-site church security team training can cost up to $3,500. But now you can learn nearly everything we teach in this massive 3-volume set. Total estimated run time is 8.5 hours. All for just $399.95 + s/h. For a limited time only get it for $199.95 + s/h! You will NOT find a better deal or video to train your team! Suggested retail price is $599.95. That is 70% off the suggested retail price. 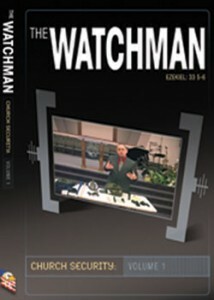 If you purchase The Watchman DVD and you want on-site training or attend one of our conferences, you will only pay the difference. So, what are you waiting for? Order your copy NOW! If you cannot access PayPal or the options on their site (such as using a credit card without an account), please try using another browser. Should that not work, please contact us and we will try to help you resolve the issue. We do not accept phone orders as we have no way to process them. You can mail a check or money order and we will ship the dvd’s once the check has cleared. You do not need a PayPal account to pay via credit card. Although we have shipped DVD’s around the world, including to our troops in Afghanistan and Iraq, we are not accepting out-of-country orders at this time. There can be a 7-10 business day shipping time depending on our travel schedule.